By sheer demographics, it's the world's most important relationship. China and India comprise 40% of humanity and boast economies that are expected to loom large over the 21st century. They also represent two of the world's fastest-growing militaries, armed with nuclear weapons, and are expanding their spheres of influence across oceans. Jonathan Holslag, a Brussels-based scholar of Chinese foreign policy and author of the recent book China and India: Prospects for Peace, is among a growing number of observers who have dismissed the idea of "Chindia"  a term once often invoked, expressing optimism over the joint geopolitical rise of the two Asian giants. He spoke to TIME about the fault lines between the two neighbors, Washington's place in the region and how tensions could escalate into war. The subtitle of your book suggests that conflict is already under way. Is greater confrontation and perhaps even war inevitable in the coming years? It's not inevitable, but peace cannot be taken for granted. The scope for these two countries to develop peacefully and fulfill their national interests without entering into competition is getting smaller due to internal social pressures and rising nationalism. I am not arguing that they don't want to develop peacefully, but that the options for doing so are not that great. They'll be competing at all levels, not only for economic opportunities, but for regional influence. This will lead to an uncomfortable and risky situation. The last war fought between India and China was almost 50 years ago. How much of a strain is its legacy? Ever since the 1962 war, both sides have been extremely cautious and suspicious of each other. There has been no resolution to the border issue [over remote, heavily militarized territories in the Himalayas] in spite of numerous rounds of negotiations and tensions that have flared recently. It's a kind of historic scar that impedes progress. And this traditional sticking point is now compounded by a newer contest. Yes, we see now that both sides' economic aspirations are leading to more competition, especially in Asia, and this is slowly spilling over in a negative way into the realm of high politics of security and diplomacy. India still has to start the industrialization of its society  a process that China began well before. Inevitably, there will be a fierce contest for raw materials, mainly in Asia. We see this already happening in Burma, in parts of Central Asia, Africa and elsewhere. This is only going to become fiercer. It's also a myth that somehow the two economies, with their different strengths, will be able to complement each other in the long term. India has to turn to manufacturing and China is not going to give up suddenly its own industries. They're too important for the country's stability. In India, there is already a widespread wariness in the media and in the public domain of China's designs for the region. Is there a similar nationalist feeling in China, which in many ways is far more developed and capable than India? Yes, you can clearly see that Beijing officials are increasingly worried about India's ambitions. If you look at the writings of Chinese experts, they refer to Indian military posturing in the Indian Ocean and also to military partnerships India is developing with several countries in Southeast Asia and East Africa. In the public realm, Chinese Netizens' views of India are very negative. You get the sense the Chinese never seemed to expect India to climb up to the ranks of the great powers. Now, as India attempts to make that leap, the Chinese are very worried of its impact on China's primacy in Asia. Hypothetically, how could some sort of military clash come about? It wouldn't first be open war. China and India are building up their interests in conflict-prone and unstable states on their borders like Nepal and Burma  important sources of natural resources. If something goes wrong in these countries  if the politics implode  you could see the emergence of proxy wars in Asia. 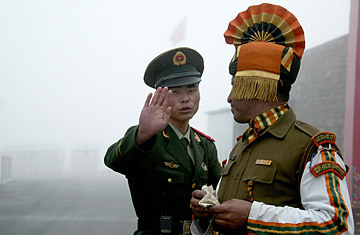 Distrust between India and China will grow and so too security concerns in a number of arenas. It's an important scenario that strategic planners in both Beijing and Delhi are looking at. What role is there for the U.S. to play in this context? Since the U.S. has prioritized stabilizing Afghanistan over everything else in Asia, it has lost a lot of credit in both Delhi and Beijing. It is increasingly reliant on China, but has also undertaken security exercises [under the Bush Administration] that tried to work together with democratic countries like Japan, India and Australia at the exclusion of China. This fed into the traditional political claustrophobia many in China have  a sense that, in the end, Asia will be a very hostile environment for their development and geopolitical rise. At the same time, India won't let itself be drowned in America's orbit. It's important for India to have its strategic independence. It has a very long and historically close relationship with Russia, which in turn is close to China. So it's a little more complicated. I don't think the Americans have thought very strategically about all of this. How much of the trouble between India and China stems from the accident of geography  that they exist side by side in a very volatile part of the world? The tragedy of continental states is that they have ever shifting spheres of influence that constantly create friction. Geographic proximity has always been one of the main factors in conflicts between great powers on the Eurasian landmass. Neither country can hide away from the other: a kind of increase of influence of one country in a border state is automatically perceived by the other as a loss in its own leverage. It creates a sense of a zero-sum game, which will be a hugely important and defining element in this relationship going forward. Watch a video about India's endangered coffeehouses.